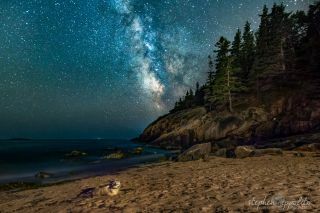 Skywatcher Stephen Ippolito captured this image of a harbor seal and the Milky Way while stargazing at Sand Beach in Acadia National Park in Maine. When one stargazer and astrophotographer went stargazing at Sand Beach in Acadia National Park in Maine, he expected to see amazing views of the Milky Way. But he didn't expect to make a new friend. "After a few shots I all of a sudden noticed something moving just a few feet from where I was standing. It was very dark and hard to see and initially I thought something may have washed up on the shore. I turned my flashlight on and to my surprise I was now standing a few feet from what I believe was a harbor seal," astrophotographer Stephen Ippolito told Space.com in an email. "I must say, I didn't expect to encounter a seal at all, I thought maybe I would see a shooting star or the northern lights, but the seal for me was a once in a lifetime moment and it totally made my night," he added.